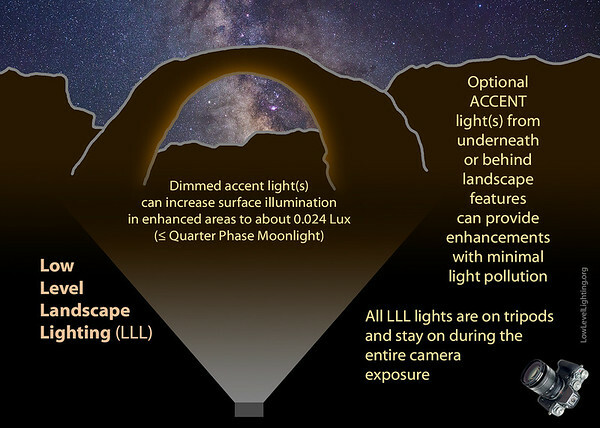 Low Level Landscape Lighting (LLLL), or the abbreviated name Low Level Lighting (LLL), is a method of lighting the landscape for Landscape Astrophotography that is more uniform and controllable and has less light pollution than light painting. It uses constant dim light, typically from from LED light panels mounted on tripods or light stands. 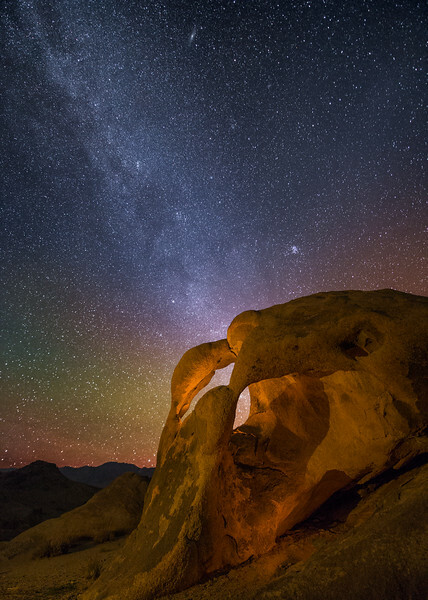 LLL is a name proposed by a group of landscape astrophotographers in 2016 to differentiate LLL from Light Painting. 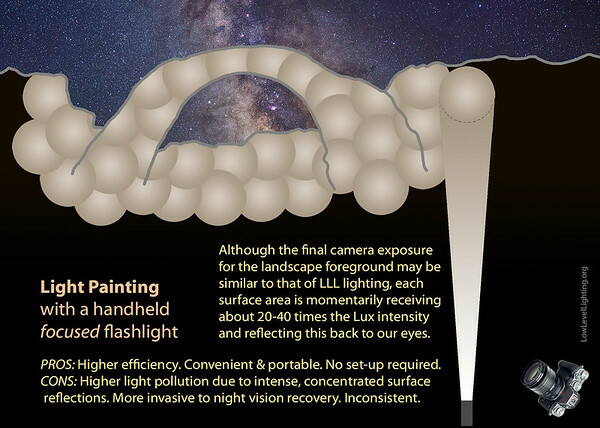 LLL has been used for a number of years in nighttime photography, but was not as widely used as Light Painting until recently. For years this technique has been included under the general term Light Painting" despite marked differences. As the technique matured a new name was proposed to distinguish the technique and has gained acceptance. LLL is most useful when photographing small to moderately large landscape features. These range from small features such as hoodoos, trees, and arches up to moderately large features such as buttes or waterfalls. Extensive landscape features such as mountains or valleys are best imaged with different techniques. The simple answer is to better demonstrate the foreground area of interest. LLL when done properly can accentuate landscape features at night and demonstrate the features even better than during the day. Why? It is because you control the light. Within the limits of the landscape you determine the angle and character of the light. In the day you do not control the light. The best you can do is show up at the right time. There are a number of alternative techniques you could use at night to demonstrate the foreground. You could obtain an additional long exposure of the foreground using starlight and blend that with a sky exposure. . Starlight, however, is a diffuse light source, coming from all directions, and it creates an effect that flattens rather than highlights landscape features. You could simply let the landscape features appear as silhouettes. This can be interesting in some compositions, but this can become repetitive and usually obscures many of the most interesting features. 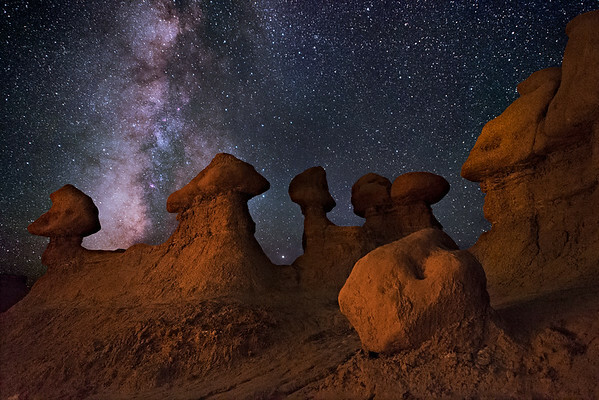 You could blend a night sky image with a foreground image taken at dusk or dawn. This can be effective, however it takes many hours and limits you to one composition per night of this kind. It can also look unnatural unless done well. With LLL you can obtain multiple compositions each night. 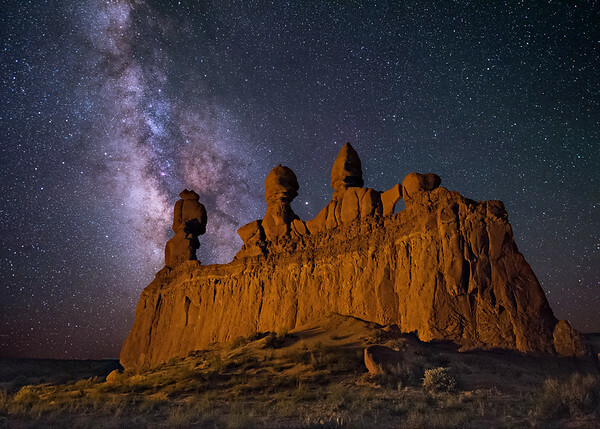 LLL is a method for lighting the landscape at night that uses extremely dim constant lighting during a nighttime photographic exposure, attempting to match starlight in intensity. LLL is more similar to “outdoor studio lighting" than to light painting. This is accomplished with constant lights mounted on tripods or light stands. The term Light Painting carries connotations of using a moving flashlight or hand held beam to illuminate landscape or other structures during a photographic exposure, frequently by direct illumination. The measurement of light falling on the earth from the overhead Sun (90º) is 129,000 Lux. At sunset this drops to 759 Lux. During the “Blue Hour” (-4.0 to -6.0º) the landscape is receiving between 29.9 and 3.41 Lux (the start of the Nautical Twilight). At the start of the Astronomical Twilight (-12.0º) the illumination from the Sun on the earth’s landscape drops to 0.00806 Lux. At the start of the Astronomical Dusk (-18.0º), illumination from the sun drops to 0.000645 Lux! What does all this mean in comparison to the intensity of Low Level Landscape Lighting? Low Level Lighting adds about 0.008 lux surface illumination. This is slightly more than starlight alone and less than a quarter moon at 30 degrees elevation. This second exposure manipulation is somewhat equal to taking a single exposure of the sky and the foreground landscape during a quarter Moon phase when the moon is 30º above the horizon (where the Lux illumination to the land is 0.00958). The disadvantages of using weak moonlight is that the 1.) photographer must plan and wait for just the right phases and angles of moonlight (all in conjunction with the Astronomical Dusk); 2. The intensity of this weak, low angle, Quarter phase Moonlight is still 4.8 times greater than starlight, so the contrast (clarity) of the stars is significantly reduced. 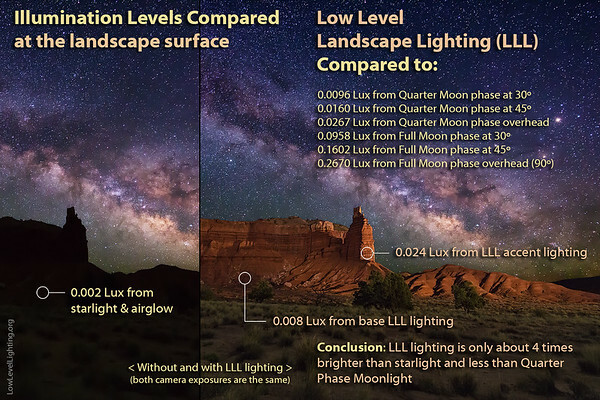 Proper LLL lighting typically matches the intensity of a foreground landscape that has received a 4-times starlit exposure (0.002 X 4 = 0.008 Lux), so its intensity is quite equivalent to the foreground illumination coming from a low angle (30º), Quarter phase Moon (0.00958 Lux). Although LLL lighting is equal in intensity to weak moonlight, it has the advantages of 1.) being able to be used any night that conditions are good for star photography; 2.) LLL lighting can be easily positioned at the needed angles for best modeling (light "sculpting"); 3.) 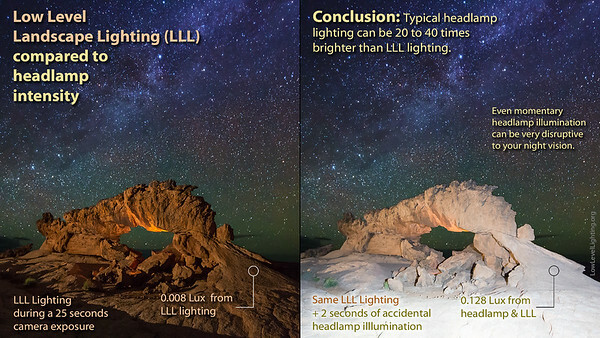 LLL lighting does not lower the night sky contrast, so star clarity is never reduced. In summary, the illumination intensity of Low Level Landscape Lighting is about equal to the intensity coming from a weak, low angle, Quarter phase Moon; and LLLL is 10 times less invasive than the light coming from a full Moon. Light Painting has significant limitations in lighting landscape at night including variation in light from photo to photo, non-uniform illumination, and significant limitation of your night vision or dark adaptation. It may also require multiple attempts to "get it right", and each photographer may want to do their on style of light painting. LLL uses constant faint lighting throughout the exposure. Once it is set up it is left on. Advantages of LLL include consistent lighting from photo to photo, much more uniform lighting within a photo, and much better preservation of your night vision. It does not need to be adjusted from photo to photo, and there is no guessing of how long to shine a light on a subject as in light painting. A single lighting setup will serve multiple photographers and eliminates the need for numerous individual episodes of individual light painting. A major advantage is that it creates little or no visible light pollution. You cannot even see the light until your eyes become dark adapted, and then you can barely see it. 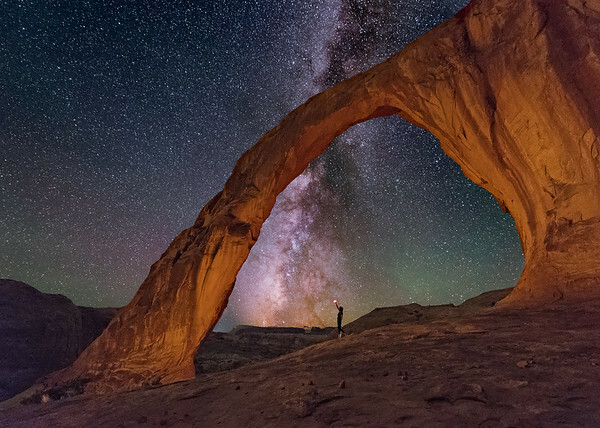 You can still enjoy the wonders of the night sky. Remember, LLL attempts to match starlight in intensity. 1) A single 25 sec exposure @ f/2.8, ISO 6400. This is properly exposed for the sky, but the foreground is underexposed. 2) A 100 sec exposure (4X the sky exposure) the to increase foreground detail, blended (via Photoshop layers) with the previous exposure of the sky. This is the “natural” method preferred by many, but because starlight comes from overhead and all around, it is like photographing with an overcast day (very flat, with little character). 3) A single exposure @ f/2.8, 25 sec, ISO 6400, with LLL lighting strategically placed. Additional detail and texture in the landscape are demonstrated. This method can properly expose the sky and landscape at the same time. Remember, you are trying to match the brightness of your lighting to the brightness of the stars. This will allow you to match the exposure of the landscape to the exposure of the sky. You are matching starlight. IT DOES NOT TAKE MUCH! The most common mistake is using lighting that is too bright. Typically, after the light is set up the lighting cannot be easily seen until your eyes are dark-adapted. This is a rule of thumb: when you are setting up the lighting, if you can actually see the light on the structure, then it is too much. Typically you set up the LED light panels on a tripod or light stand, and leave them on for the whole photo session. In this way, LLL is more like outdoor studio lighting. You will use a primary light but can also use a fill light, accent lights, and back lighting. All of these need be very dim. It is best to locate the light about 45-60 degrees off to the side of the camera position, and it is advantageous to place them at least a 100 feet (30m) from the focal point if the landscape allows. The farther the lights from the focal point, the more uniform the lighting. The angle of light creates shadows or relief in the rocks or landscape structures and adds a feeling of depth. Lighting a structure from the camera position creates a very “flat” looking image. You also need to get the light source off of the ground. The closer it is to the ground, the worse the shadows from stones and bushes. It is best to place the lights on tripods or light stands. If hiking you can carry small lightweight tripods for the lights, for example small tripods in the range of 42 to 50 inches tall. These can weigh as little as 1 lb. tor 1/2 kg. You can elevate these even further by placing them up on large rocks if possible. When hiking lightweight equipment is a must. If you do not have to hike a long distance you can use light stands to elevate the lights even more. This is optimal. Reasonable sizes are 10 feet or 13 feet (3 - 4 m) tall light stands (see below). These are also very lightweight and easy to carry, and are wonderful in eliminating harsh shadows on the ground. It is also very desirable to get some distance between the lighting source and the area of interest. The farther away the light, the softer and more uniform the lighting appears. As always, you have to work within the limitations of the landscape. Turn the light down very low, usually to the minimum, or near minimum. There is usually some adjusting and rechecking the light. Set up the lighting, walk back to the camera, do an exposure, check the results, and go back and readjust the brightness of the lighting. This may take several adjustments. It is easier with two people, but it is not hard to do alone. If the light is still too bright even on the lowest setting then cover the light with a white cloth, such as a white handkerchief or napkin. If it is still too bright then double up or triple up the thickness of the cloth. It is easy to damp down the intensity this way. You can use tape or a rubber band to keep the cloth in place. Another useful technique is to point the LED light away from the focal point and bounce the light off of adjacent structures. This will diffuse the light and make it softer, dampen the intensity, and the reflected light may more closely match the color of the natural rocks (or trees, etc.). After you get the lights set up you can take multiple exposures, move positions, adjust camera angles, obtain multiple panorama images, etc., and always be sure of the same uniform lighting. This ideal for lighting panoramas. You can place a light behind or under a structure or in front of a structure for accent lighting. You can use slightly different filters (color) to make one light slightly warmer than the other. This may help to add a feeling of depth. Many LED lights have a cool color temperature and are too blue resulting in an unnatural color to the landscape. Fortunately most of the light panels come with warming filters. You can also purchase light panels with an adjustable color temperature, but these are more expensive. Many of the light panels that have warming filters or diffusion filters use small magnets to attach the filter to the front of the light. These magnets lift them the filter off the front of the light, and there may be a “blue” light leak around the edges of the filter. This can look unpleasant if you capture image some of this blue light. You can use black gaffers tape to tape around the edge of the filter to stop the light leak. You can make your own warming filter For LEDs that do not come with them or if you want to adjust the color temperature yourself. These are easily made from Theatrical Gel (see specific types below). You just cover the light with a sheet of gel and tape it in place. These come in many colors but the ones useful for this purpose are in the yellow to orange range. A 20 X 24 sheet of gel usually costs about $8 USD at Amazon or B&H Photo Video. Several useful ones are listed below. Remember, when speaking of lights, less can be better. The more a light can be dimmed, the more useful it can be. The listed lights are all dimmable and useful for LLL. Low Level Lighting at Trona Pinnacles, Ca. excellent ~ I wish you had made a film from start to finish also, it would be great for photographers to understand Project planning and also Software process including Astro tips and mistakes to watch out for .. u know you wanna !! Since I don't have the budget for LED lights (yet), what about using flash? I know this may require some test shots but once you get the technique down it could work. 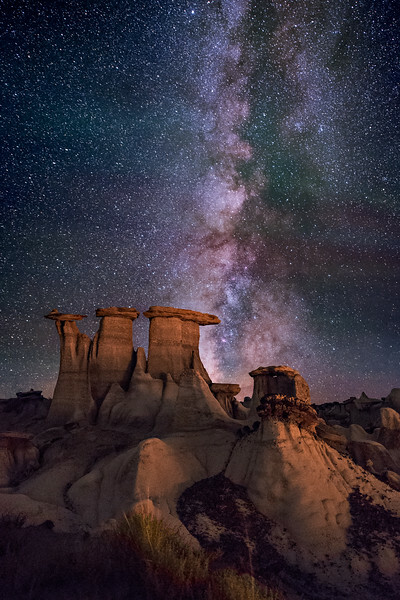 Great site for those getting started in Milky Way nightscapes. For those of you that want to learn more about light placement you should read Royce Bairs e-book "Milky Way Nightscapes", it has everything they need to know about the subject of light placement and more, complete with diagrams and mathematical calculations. Well done Wayne!!! You too, Royce!! Thanks for this. However, I strongly agree with the comment by Mark Jarrett that this article and site would be so much more useful if the images provided an indication as to light placement, type of lights and settings used.